Brick was founded in London, Ontario, Canada in 1977 and is printed biannually. They have published over 80 issues. Originally staring out as only doing book reviews to now transforming in to a more general literary magazine. Now the magazine has a strong emphasis on literary and creative non-fiction writing. Buy a single copy or subscription to Brick magazine. 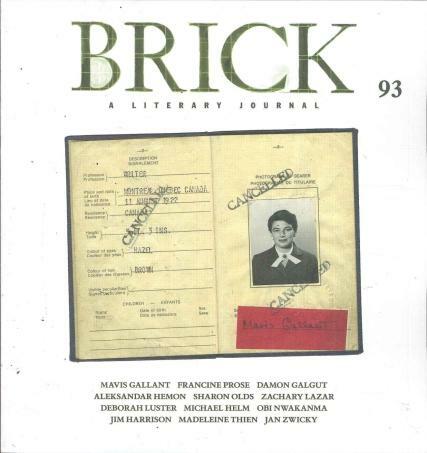 Every issue of Brick magazine features some of the world’s best-loved writers. The magazines content on is based on having lively, personal discussions about writing. Other topics include film, art, and science. Pretty much any topic that fills the imagination of the writer. Brick has readers in nearly fifty countries and sells consistently well in independent bookstores across America and Canada. The brick magazine has built a strong fan base of several years, by changing with the times their content has evolved over time. The brick magazine has some of the most dedicated readers within the magazine industry.